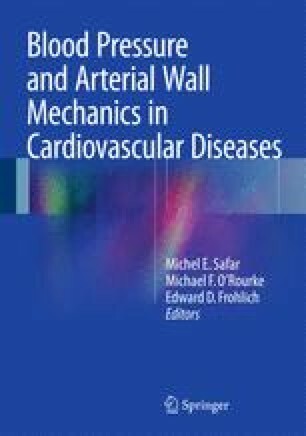 In recent years, many studies emphasized the role of arterial remodeling in the development of cardiovascular diseases, and it was shown that stiffening of arteries is associated with increased cardiovascular mortality and morbidity. Moreover, arterial stiffening is linked to decreased glomerular filtration rate, and is predictive of kidney-disease progression and the patient’s cardiovascular outcome. Early vascular aging and arterial stiffening are observed with progression of chronic kidney disease (CKD) and in end-stage renal disease (ESRD). This accelerated aging is associated with outward remodeling of large vessels, characterized by increased arterial radius not totally compensated for by artery wall hypertrophy. The mechanisms involved in large artery remodelling associated with CKD are complex including arterial calcification, inflammation, oxidative stress in association with mineral and bone metabolism disorders. Arterial stiffening in CKD and ESRD patients is of multifactorial origin with extensive arterial calcifications representing a major covariate. With aging, arterial stiffening is more pronounced in the aorta than peripheral conduit arteries, leading to the disappearance or inversion of the arterial stiffness gradient and less protection of the microcirculation from high-pressure transmission. Various non-pharmacological or pharmacological interventions can modestly slow the progression of arterial stiffness, but arterial stiffness is, in part, pressure-dependent and treatments able to stop the process mainly include antihypertensive drugs.